Phlebotomy is the term used for the process of drawing blood. 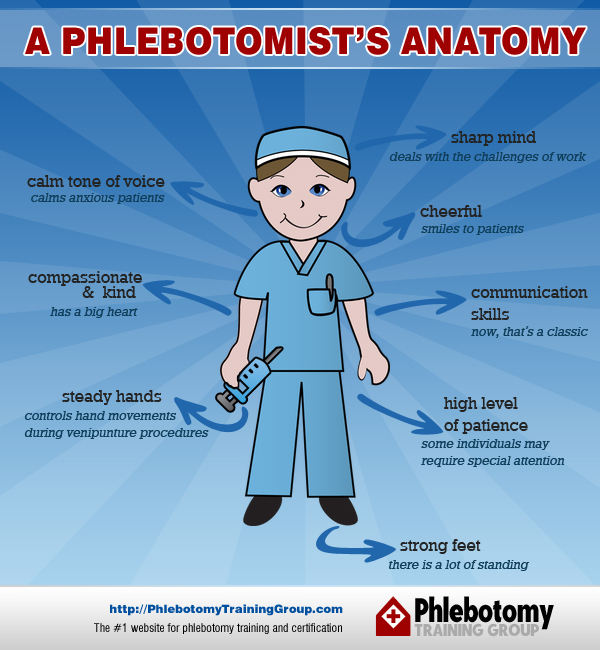 A phlebotomist is a health professional. Phlebotomists are responsible for collecting blood samples from patients. This blood will be used to help monitor a patient’s health and/or assist a physician in diagnosing a medical condition. In some cases, the purpose of blood drawing is disease treatment (see: Therapeutic Phlebotomy). Some phlebotomists will work at donor clinics or with blood drives to help obtain the blood from donors to be used for patients who require a blood transfusion. The main duty of a phlebotomist is performing venipuncture, which refers to inserting a needle into a vein to draw a blood sample. This process involves more than just drawing blood, however. After assessing the patient’s physical status, a phlebotomist reviews the test order forms and determines the best puncture site for the procedure. A phlebotomist also has to know the right order for drawing blood samples, as the results of certain blood tests can be compromised if they are not drawn in the proper order. Some of the test tubes contain substances that mix with the blood samples and prepare them for laboratory analysis. 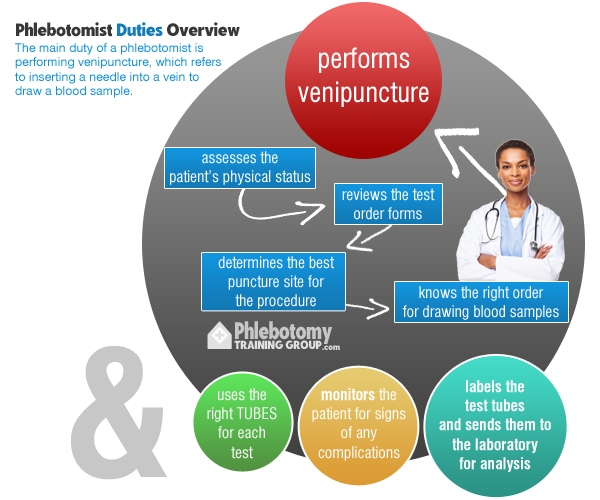 A phlebotomist must also know the contents of each tube and use the right tubes for each test. For example, test tubes with a light blue top contain sodium citrate. These tubes are used for prothrombin time, fibrinogen, lupus anticoagulant, and partial thromboplastin tests. The tubes with the royal blue top contain potassium and a type of acid. These tubes are used for testing levels of lead, cadmium, mercury and arsenic in the blood. Once the right tools and supplies have been gathered, it is time to perform the blood draw. The phlebotomist selects the best venipuncture site and may use a tourniquet to make the patient’s vein more prominent. After inserting a needle into the patient’s vein, the phlebotomist allows the blood to collect in the test tubes and monitors the patient for signs of any complications. Once there is enough blood to perform all of the requested tests, the phlebotomist withdraws the needle and stops the bleeding with a piece of gauze. If the patient does not feel faint or experience any other complications, the phlebotomist immediately labels the test tubes and sends them to the laboratory for analysis. If you want to become a phlebotomist, you should not be squeamish when viewing or working with blood and other types of specimens. 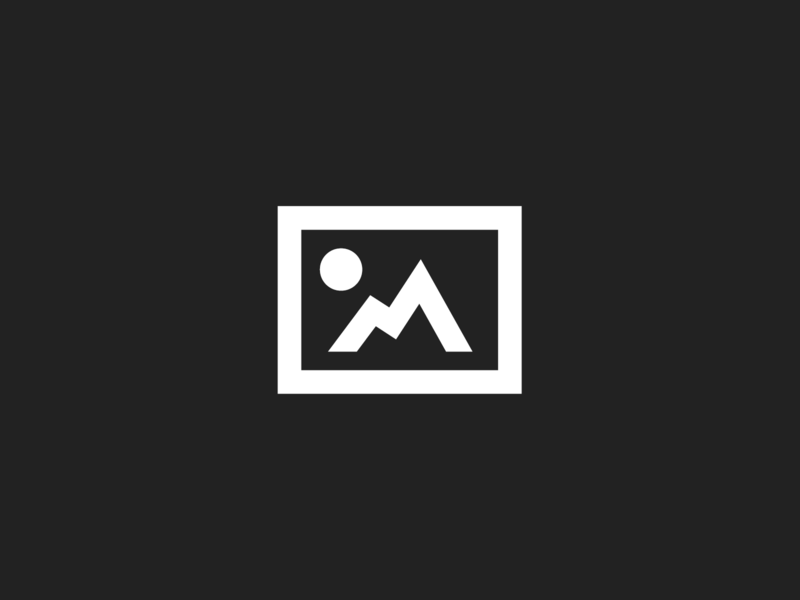 As a phlebotomy technician, you will perform various duties. The duties you perform depend on your level of training and place of employment. If you decide to become ASCP Certified in phlebotomy, you may perform additional duties. You may complete certain tests in the laboratory for/with the technicians and collect other kinds of specimen samples for testing.